For centuries artists have imagined the crucifixion not only as a biblical narrative, but also as an event happening in their own historical context. This strategy of depicting the crucifixion in contemporary terms, both makes Christ more directly present in the time and place of the contemporary viewer and employs the crucifixion as a point of reference for critically understanding modern life. Working in the early 1930s, Frederick Wight imagined the crucifixion as happening in Chatham, MA, USA with the sea-faring folk of the town that he knew. Modern Crucifixion, a triptych measuring 90 x 162 inches, was shown for the first time at the New School of Social Research on January 16, 1933 and according to several news media it created a stir because the people were in “modern garb.” Some reporters went so far as to comment on the young girl in “high heels,” as well as how the kneeling mother of Jesus wore a “modern dress” and had “bobbed hair.” It is interesting that in the 1930’s this seemed so novel given that depictions of the crucifixion have often included the people in the historical context of the artist. The clean-shaven Christ figure on the central cross was a composite of several Chatham men and he fashioned the two thieves from models that he hired, never disclosing their names. Interestingly, each man is held in place with ropes or lines from a fishing boat, a method that archaeology has verified for Roman crucifixions. Most of the other participants in the foreground have been identified, but other figures remain a mystery. Townspeople dressed in sou’westers and fedoras are climbing the embankment as they approach Chatham’s Golgotha with their hands folded in reverence. A soldier whose outfit suggests a commentary on the Nazi problems arising in Germany in the early 1930s helps a woman dressed in white. Frederick Wight has carefully placed several elements in the triptych that further amplify the biblical text. The lighthouse is a carefully placed symbol that recalls Jesus saying, “I am the light of the world.” The sky has been painted in such a way to appear as a dark torn curtain hovering in the sky, reminding us of the passage in Matthew’s Gospel that the curtain of the temple was “rent in two” at the moment of his death. Wight divided the sky to shape a mandorla-like glow of light around the crucified Christ to focus attention on the central figure of the sacred event. Many intriguing questions arise in the interpretation of the scene—one being the identification of the three women. Usually it is easy to recognize the women at the crucifixion—Mary the mother of Jesus, Mary Magdalene, and Mary, the wife of Clopas, but in Wight’s painting questions arise. The older woman sitting on the ground to the right of Jesus is certainly Mary, his mother, being helped by John. The woman to the extreme left holds up a baby as if to offer the child in an act of sacrifice or worship. Is this the Mary with baby Jesus who “pondered these things in her heart” knowing that he would someday die, or is she in the temple for his dedication? The third young woman is dressed in blue, a typical and symbolic color for the Virgin Mary, possibly recalling Mary at the Annunciation. Did Wight somehow embed into this crucifixion scene a theme of Mary? Or are the women the three separate Mary characters traditionally present at the crucifixion scene? Another angle from which to view Modern Crucifixion by Frederick Wight is in the light of the Social Justice movement that was sweeping the United States. With the impact of the Great Depression the plight of the worker was a human and political concern. In Modern Crucifixion Frederick Wight has placed ordinary workers from a seacoast village of the 1930’s at the scene. By depicting the crucifixion in the 20th century, Wight continues a long tradition of placing “us” at the scene of the cross. Wight’s painting helps us contemplate how the crucifixion was not just an event that happened 2000 years ago, but how all our sins and personal failures continue to crucify the Lord. Christ died for all the sins of the world, both then, now, and for future generations. Wight understood this theological concept and has challenged us, some eighty plus years later, to study his interpretation of the crucifixion and consider its implications in a world far removed from his quaint fishing village on the coast of Cape Cod. Frederick S. Wight: Modern Crucifixion, 1933, 90 x 162 inches. Frederick S. Wight received his master’s degree at Harvard studying in Paul Sack’s museum training program. He went on to be Associate Director at the Institute of Contemporary Art in Boston. In 1953 he became the head of the art department at UCLA and Director of what is now the Frederick S. Wight Gallery at the university. He is credited with helping shape Los Angeles’ engagement with modern art to become a major art center. Show at St. Christopher’s: The Gallery at St. Christopher’s, 625 Main St., Chatham, MA, is proud to present Crucifixion: Frederick S. Wight and other 20th Century Artists. 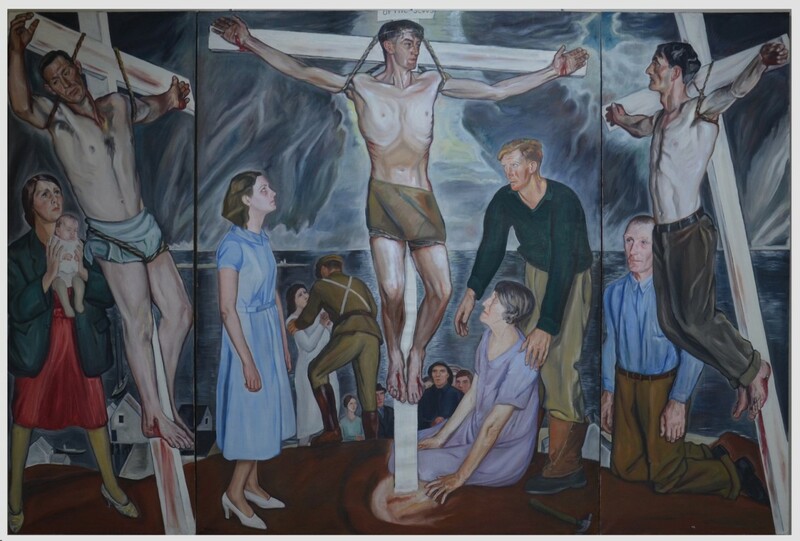 The centerpiece for this show is the large Modern Crucifixion triptych painted by Frederick Wight in the early 1930s when he was living in Chatham, MA on the Atlantic coast. All the characters in the painting were sea-faring folk of Cape Cod that Wight knew. This exhibition offers an intimate glimpse into how artists of the last century artistically wrestled with the Crucifixion. Twenty artists are brought together to offer a dramatic visual dialogue about how the Crucifixion and its relevance in recent history are envisioned. Included in the show are such artists as Georges Rouault, Marc Chagall, Eric Gill, Pablo Picasso, Otto Dix, Lovis Corinth, Ed Knippers and Nancy Snooks. For more info and to read the essay accompanying the show go to http://stchristopherschatham.org/gallery/. Sandra Bowden is a painter and printmaker living in Chatham, MA. In 2005 Square Halo published The Art of Sandra Bowden. With over 100 one person shows, her work is in many collections including the Vatican Museum of Contemporary Religious Art, the Museum of Biblical Art, and the Haifa Museum. She is also a passionate collector of religious art dating from the early 15th century to the present. Sandra was president of Christians in the Visual Arts from 1993-2007 and has curated many exhibitions and coordinated the CIVA exhibitions program since its inception. She studied at Massachusetts College of Art and received her BA from the State University of New York. For more information, go to www.sandrabowden.com.